Toyota is renowned for its outstanding quality and unmatched reliability. 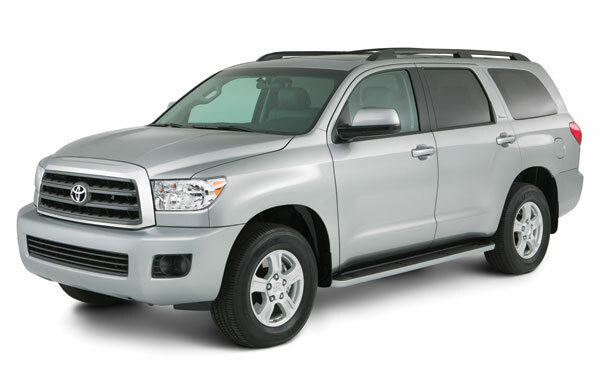 The 2017 Toyota Sequoia is a full-size SUV offering V8 power with seating for seven or eight adults. 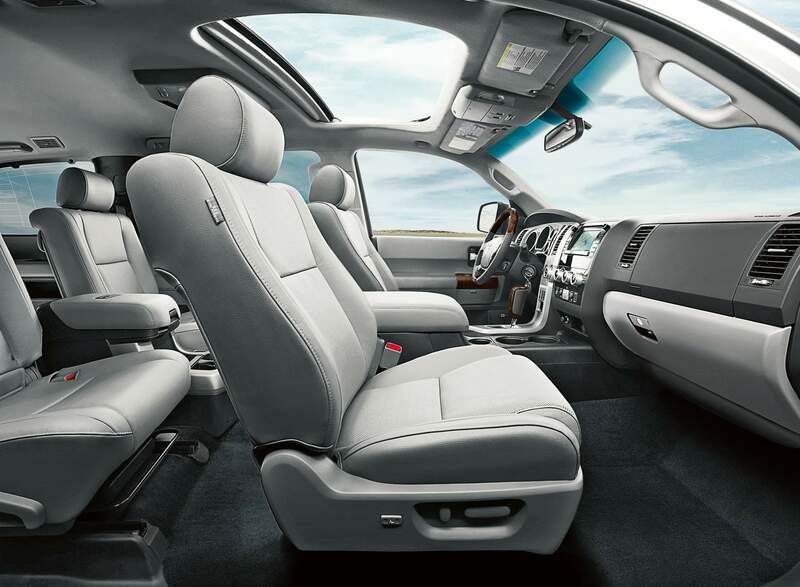 The Sequoia is available in three different trim levels with a starting MSRP of $56,525. Come to Sherwood Park Toyota to take a look at everything the 2017 Toyota Sequoia has to offer. The 2017 Toyota Sequoia comes with a 5.7-litre, DOHC 32-valve V8 engine coupled with a six-speed automatic transmission. The engine generates 381 horsepower and 401 ft.-lb. of torque. The Sequoia has an on-demand four-wheel-drive system which gives the driver the ability to choose between rear-wheel-drive and four-wheel-drive on the fly. Fuel economy comes in at 18.8 L/100km in the city and 14 L/100km on the highway with a towing capacity of 3,220 kg (7,100 lb). The 2017 Sequoia comes with standard eight airbags throughout the interior of the vehicle to ensure safety for its occupants. As with many Toyota vehicles, the Sequoia comes with the Toyota STAR® Safety system which includes a host of intelligent safety features. The combination of anti-lock braking, brake assist, and traction control help maintain vehicle stability while keeping the wheels safely on the ground. The smart stop technology actively monitors obstacles in the front of the SUV and can brake the vehicle if the driver does not respond to early warnings. The 2017 Toyota Sequoia comes standard with a reverse camera employing front and rear clearance sonar which audibly alerts the driver if there is an obstacle in front of, or behind, the SUV. The 2017 Sequoia is a large, brawny SUV in every sense of the word. With a high stance and stylish design, it is a beautiful full-size vehicle that sits on 18”, or available 20”, alloy wheels. Bi-xenon headlights allow for a great improvement in lighting up the road ahead. 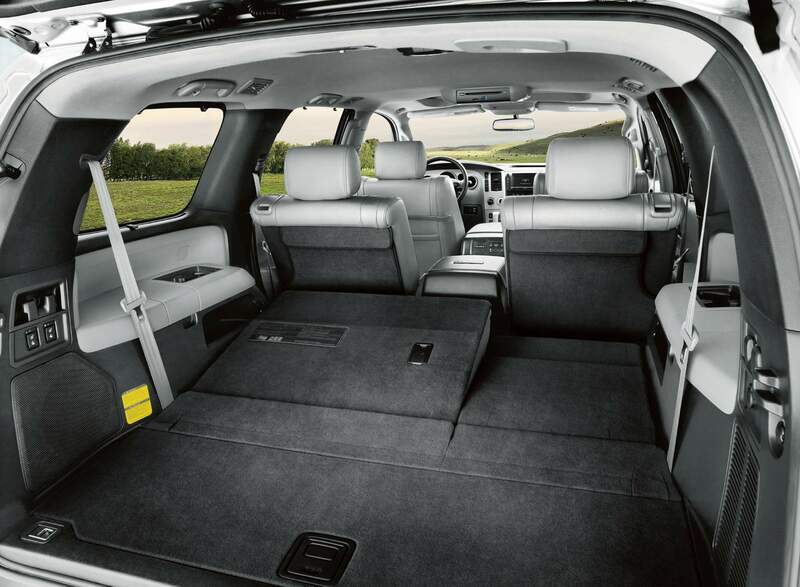 The Sequoia offers a full range of premium comfort and convenience features such as a premium audio system, Bluetooth® capability, power adjustable heated seats, power tailgate window, a power moonroof, and stylish running boards along the side of the vehicle. The interior has an abundance of space and all surfaces are soft to the touch. The 2017 Toyota Sequoia comes with a host of technology features to give the occupants the highest quality driving experience. 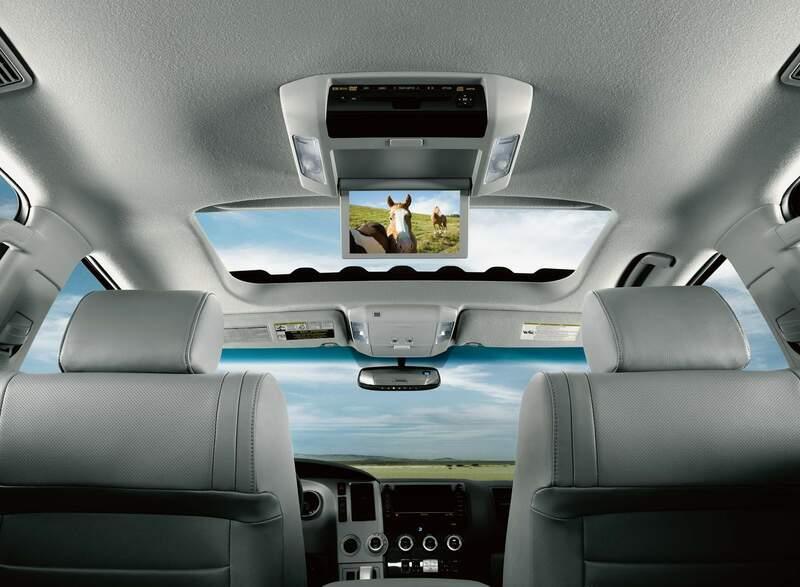 The 6.1” touchscreen audio screen is integrated with Bluetooth® technology and comes with a backup camera. Available on the Sequoia Limited trim or Platinum trim level are SiriusXM radio and the added convenience of voice-activated navigation. The interior of the SUV features a three-zone climate control system with automatic air-conditioning and left/right/rear independent temperature controls. For a relaxed driving experience for those long trips, the Sequoia offers its driver available dynamic laser cruise control. This system automatically adjusts its speed with the use of on-board sensors to maintain a safe distance from vehicles ahead. 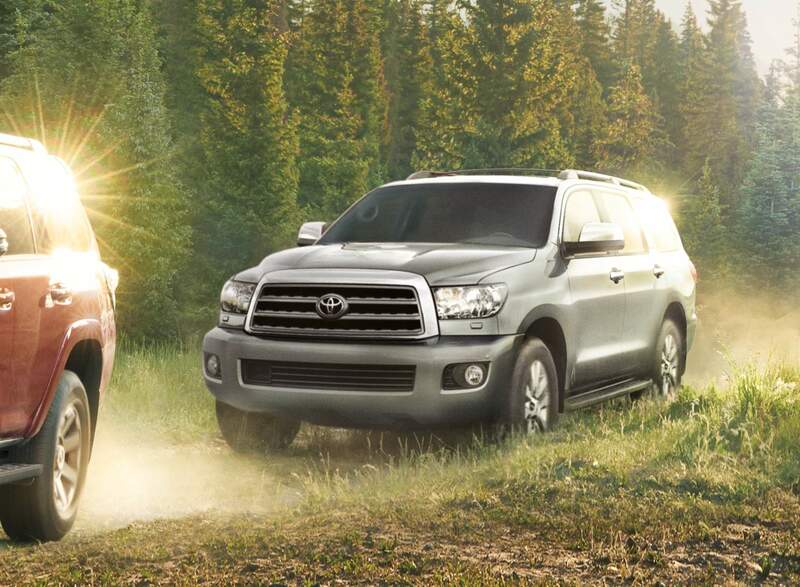 One of the best in its class, the 2017 Toyota Sequoia is the perfect vehicle for anyone looking for a full size SUV. Power, space, reliability, and safety come standard with the 2017 Sequoia . Come to Sherwood Park Toyota today to see the Sequoia in action with a test drive. We are located at 31 Automall Rd, Sherwood Park, Alberta, or call our expert Sales Staff at (780) 410-2455 for any inquiries. Equipped with amazing features including power rear window, back-up camera, Bluetooth connectivity, power moon roof and much more. Cash price advertised, financing and leasing available on approved credit. See dealer for details. Features include: - Leather Interior - Heated Front Seats - Back-Up Camera - Lane Departure Alert - Power Folding Third Row Seats - Power Moon Roof Give us a call at (780) 410.2455 to book your appointment today at Sherwood Park Toyota. Located at 31 Automall Road in Sherwood Park, AB. Discounts advertised use Toyota cash rebates and are subject to Toyota rules and regulations. Some rebates may not be available depending on type of sale. Rebates may not be combined with finance options. Offers may change at any time without notice by manufacturer. Please see Dealer for details. Equipped with amazing features including power rear window, back-up camera, Bluetooth connectivity, power moon roof and much more. Cash price advertised, financing and leasing available on approved credit. See dealer for details. Features include: - Leather Interior - Heated and Cooled Front Seats - Back-Up Camera - Lane Departure Alert - DVD Player - Power Moon Roof Give us a call at (780) 410.2455 to book your appointment today at Sherwood Park Toyota. Located at 31 Automall Road in Sherwood Park, AB.